The number of Hand, Foot and Mouth Disease cases reported this year till Aug 18 stands at 53,156. 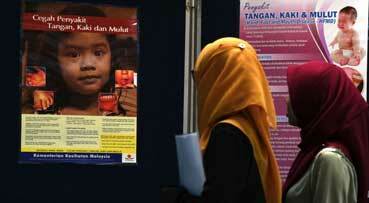 During the period, there were two deaths due HFMD and EV71, one in Sarawak and the other in Penang. Health Director-General Datuk Dr Noor Hisyam Abdullah in a statement on his official Facebook account said the number of cases reported for the week Aug12-18 was 3,286 cases, a drop of 1,304 cases or 25.4 per cent as compared to 5,130 cases the week before (Aug5-11). “All states showed a drop in cases except for Perak),” he said. He advised parents with small children to exercise greater caution regarding hygiene during the Aidiladha/school break and try to avoid public places that are congested if possible.